The conversion of roundwood to a saleable product includes not only the sawing, slicing, or felling of wood, but also the drying, gluing, pulping, and other required processes. The distinction between a primary product, lumber for example, and a secondary or semi-finished product, like furniture stock, may be rather small. Consequently, while our focus will be on primary conversion techniques, we may occasionally refer to secondary processing to clarify the description. Because there are so many conversion techniques in the industry the treatment of any particular process will be brief. The focus will be on the conversion of roundwood into solid wood products. Other items, such as panel products (particle board), pulp and paper, and sawmill residue products (pellets), will be referred to briefly. Traditional equipment will be described with occasional brief reference to modern, up-to date technology. 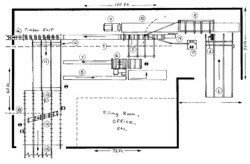 A sawmill consists of the following pieces of equipment which have been identified on a floor plan (see Figure 22). A log live deck (1) brings softwood or hardwood logs to the carriage (3). Logs are loaded onto a carriage (3), with the assistance of a log turner (2). Logs are held firm on the carriage by dogs (see Figure 23). The carriage and log pulled by a cable, runs on tracks (10), with the log encountering a circular headsaw (19) along its path. 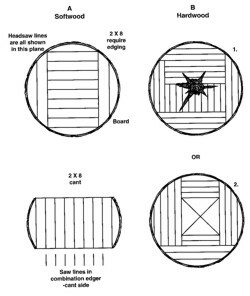 A slab (see Figure 24A) is removed, the carriage is pulled back to its original position and the log is advanced toward the sawline, through the action of the setworks, by the amount to be cut; eg. 1 inch'. The carriage and log are again pulled through the headsaw, this time removing a board with bark along each edge. The log is turned and this process is repeated until the log is completely sawn, as shown in Figure 24B. The main 8-inch thick cant is sawn on another machine and will be described later. After the board leaves the headsaw, it falls onto a short live roll case (10) to a stop where it is kicked sideways onto a transfer chain (5). In some mills the roll case (10) also dips below the floor surface allowing slabs to be dumped beneath the mill floor, to a chipper. The transfer chain conveys the board to a combination edger (6) where the two live edges are removed and the board is now square-edged. Later you will note that square edge lumber is produced in one pass by the cant side of the combination edger (see Figure 24A). Sometimes a timber will be produced from the centre of the log (see Figure 24B). These will travel the length of the mill to a trimmer (16). Lumber from the edger must also travel, by conveyor, to a trimmer (13). After being trimmed, lumber exits the mill and is placed in piles.
' Actually, when the carriage setworks moves the log into the line of the saw for 1-inch lumber, it must also include allowance for the thickness of the headsaw (kerfi. If the saw tooth is 1/4 inch thick, then the advance is 1 1/4 inches. The same would apply for 2-inch lumber; eg. the set would be 21/4-inches. The sawyer must always keep the saw kerf allowance in mind. When using an automatic carriage, as shown in Figure 23, this allowance is programmed into the setting device. We have described a traditional circular sawmill which is found commonly throughout Nova Scotia. Other headsaw options include single or double-cutting bandsaws (see Figure 26); twin circular (Scragg) headrigs; twinbands or quad-bands (see Figure 27) and many other arrangements including profiling chipper canters, frame saws, etc. Even a large chainsaw with an adapter kit can produce lumber. In the example, log feed is accomplished on a traditional carriage (see Figure 23). In other headrig options log feed may be achieved through lug chains, sharp chains, alligator chains (see Figure 27) and overhead end-dogging devices. Similarly, there is a variety of secondary equipment, including edgers, trimmers, and resaws, commercially available. If you have a fairly large woodlot and are regularly harvesting a substantial number of sawlogs, you may consider a portable band or circular sawmill. These units are gaining popularity and produce excellent lumber. The band variety produces a superb surface. They are quite accurate when the saws are sharp and feed speed is kept low. The disadvantage is that they are very slow. Getting 2000 fbm per day from these units is really pushing it. Figure 25 shows a number of these machines on the market. The most important product of the sawmill is lumber. In softwood sawmills, lumber is usually sawn to construction grade requirements (lumber grades will be discussed in the Lesson Five). This means mostly 2-inch material, such as 2 x 4, 2 x 6, 2 x 8 - in various lengths. One-inch material is usually taken from the slab area. The 2-inch material is called dimension lumber; while one-inch is called boards. Softwood lumber is used in light construction, and most finds its way into wood-frame housing (see Figure 28). Examples of softwood dimension lumber include studs, joists, and rafters, while boards are used for sheathing and strapping. The product of a sawmill is rough lumber. Before it is used in wood frame construction, it is usually dressed, four sides. Dressing is performed by high-speed planers, having four or more cutter heads. Dry dimension lumber (19% m.c. and lower) is dressed to 1 ½ inches in thickness. Green dimension lumber from the sawmill is dressed to 1 9/16 inches in thickness. For those not familiar with the conversion of hardwood logs into lumber, few similarities exist between it and softwood lumber. Although the milling process may be similar (see sawing pattern, Figure 24B) the sawmill ideally should be designed specifically for hardwoods. Little hardwood is used for light frame construction. Hardwood, or factory lumber is principally used in remanufacturing, or secondary manufacturing, and is cut up into other products. Factory lumber is usually cut up into shorter, narrower pieces, while softwood lumber is usually used as is. It is graded in a different way than softwood. Strength is not generally as important in hardwood as appearance. In most applications, defects (knots, bark, holes, etc.) are removed to obtain a clear cutting. Clear cuttings will be discussed in more detail later on. A large percentage of sawn hardwood lumber is used by the furniture industry. Figure 29 shows a hardwood board of medium grade, No.2 Common. When the furniture plant receives this board it cuts out the defects to produce clear cuttings. These cuttings are then glued into panels (cuttings of the same length and thickness but random widths), which are then machined and assembled into a piece of furniture. An important feature of this production process is the utilization of short lengths. Eighty-five percent of all furniture parts are less than 4-feet in length. As a result many furniture companies saw only short logs (3 to 7 ft) in their sawmills. Today, many more purchase part of their requirements as dimension stock rather than long lumber. Dimension stock is a cut-to-size, wood component normally kiln-dried, usually one-inch in thickness (4/4), that is supplied by a plant other than the furniture manufacturer. Do not confuse hardwood dimension stock, with softwood dimension lumber. In softwoods the term `dimension' always refers to the thickness of the material; ie. 2-inches (8/4) and up. One of the most common types of primary break-down machines to produce dimension stock is the short-log bolter (Figure 30). These machines, however, are gradually being replaced by short-log carriages - specifically designed for bolts 3 - 8 ft. in length. Dimension stock may also be produced from standard factory lumber. 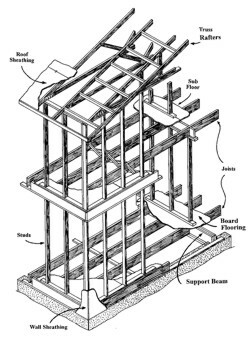 ladder rails: No compression wood; straight; rate of growth must be about 6 rings per inch; maximum slope of grain is 1 in 12; knots are generally not permitted; no rot; maximum moisture content - 15 percent; these are manufactured to customers' sizes; Wooden ladders are still widely used, particularly by utility companies, since they are less of a hazard in transmitting electrical current. Most ladder rails are made from West Coast species, but other softwood species may be used. moulding stock: This material, in a variety of lengths, widths, and thicknesses, is used to make interior and exterior mouldings used in house construction. It includes quarter round, half round, crown, cornice and many other patterns. Softwood mouldings are usually painted, although some species such as white pine and spruce are given a natural finish. Moulding stock must be free of defect, usually straight-grained, the mouldings themselves must be free of dressing skips and similar imperfections. Mouldings are produced on a multi-head moulder. other millwork: Mouldings are usually classified as millwork. This category also includes handrails, stair treads, window sashes and frames, picture frames and others. Many of these products require a high proportion of long lengths which is being met increasingly by finger-jointing. In this process, short clear pieces of lumber are end-glued into long continuous strips. White pine, aspen, and clear spruce are excellent species for millwork. furniture: This industry is based primarily on hardwoods. However, furniture is also manufactured from softwood species. White pine - because it was plentiful and very easy to work - was a favourite furniture wood of the early settlers. In the last 15 to 20 years, there has been a strong renewed demand for white pine furniture. Much of this has been in the form of reproductions of the early `Canadiana' designs. Other softwood species used for furniture include cedar, larch, Jack pine and red pine. Some very interesting designs can be found in furniture from these species, particularly in the finishing techniques used. The grade requirements for softwood furniture sometimes follow those of hardwood, that is, clear cuttings. However, rustic pine furniture is manufactured that incorporates knots, colour variations, bark pockets, etc., providing a very pleasing effect. Clear hardwood stock for furniture and other products was covered earlier. Another type of furniture component is called frame stock, which is used in (1) the upholstered furniture industry as the frame to which upholstery is stapled and (2) as the interior frames of cabinets and other pieces of furniture. Hidden within the finished product, frame stock needs only be strong enough to perform its function. It is usually selectively recovered from the lower grades of lumber. Its main feature is market price, up to three times that of pallet stock, with which it competes. However, pallet stock can also be a good outlet for low-grade material. Furthermore, pallet lumber can be easily upgraded into cut-to-size pallet stock, ready to nail. Prices for pallet stock are generally low but there is a fairly good market in Nova Scotia. The `traditional' mill, you may recall, has a combination edger. This means it can handle boards and dimension on one side, and cants on the other. In the example shown in Figure 24A, the softwood log is being `cant sawn'. Boards and dimension are removed on the headsaw from opposite faces until an 8-inch thick cant is made. The cant is then kicked off the carriage and makes its way to the cant side of the edger. In one pass the cant is sawn into about 6 pieces of 2 x 8. The material in the two-slab portions of the cant can be sawn, into boards and dimension lumber requiring edging. Or the slabs (thick) can be directed to a resaw (not shown) further down the line. Speed is of the essence. The quicker the log can be processed and removed from the carriage (to receive the next log), the higher the production. 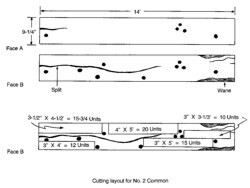 Two sawing patterns (see Figure 24B) are shown for hardwoods. In B 1, the log is completely cut up on the carriage into boards. (We might have sawn some 2-inch stock as well.) The cutting lines in the figure show the log was turned many times. This is called turning for grade and is the accepted method of sawing quality hardwood. This way sawing continues on a face until defects are encountered. The log is turned to a new face and sawn until defects occur on that face - and so on. Usually, when all faces are showing defects, the remainder of the log is quickly cut into whatever it will yield. In B2, the log has also been turned frequently for grade but the centre portion has been reserved for production of a timber (or tie, mine pack, pallet cant, etc.). The production of timbers increases productivity somewhat. The down-side is that the timber may contain potentially high quality lumber on one or more of its faces. Before lumber is used, it should be dried. As a minimal requirement, air drying should be carried out. Building codes usually allow a maximum of 19 percent m.c. which can be easily obtained by air-drying during the summer. Air-drying requires holding lumber inventories for lengthy periods. To air-dry lumber effectively, the piles must be prepared carefully. Stickers between each course of lumber must be placed accurately across the pile, and they must be lined-up accurately with respect to pile height. Ideally, the top of the pile should be capped by a slanted piece of plywood to shed rain. Piles should be located so their length is at right angles to prevailing wind direction to improve the flow of dry air through the courses in the pile. Pre-drying is usually carried out on lumber that will eventually be kiln-dried. The techniques can be elaborate or very simple. The simplest method uses a large fan to direct outside air through the pile. The process is done only on warm, dry days and the only energy required is for the fan. Depending on outside temperature and humidity, pre-drying can quickly reduce the moisture content of green lumber. Before installing and operating a kiln, read extensively on the subject. More important, attend one of the many kiln-drying short courses such as those offered by the Maritime Forest Ranger School in Fredericton. There are many types of dry kilns on the market. Only steam kilns and dehumidification kilns will be discussed. But first, the drying process will be discussed to see what is required and what the dangers are. Moisture is mainly removed at the wood surface by evaporation. To obtain good evaporation conditions, the surrounding air must be dry enough to absorb the water at the surface. To speed up the process heat is applied to the wood, and with fans, increase the movement of air across its surface. In the early stages of kiln-drying the following happens: (1) moisture is rapidly lost at the surface in a shell (see Figure 31); (2) a moisture gradient is set up between the shell and interior; (3) the shell dries below fsp and begins to shrink; (4) the interior, or core, does not shrink because its m.c. is still very high; (5) thus, the shell tries to become smaller (stretch) around a core that resists this shrinkage; (6) stresses are set up in the shell (as if a piece of rubber was stretched around the core); and (7) if the stresses are great enough, the shell cracks. These cracks are called seasoning checks (see Figure 10) and can permanently damage the wood. In oak, for example, with its large rays, checks develop along these lines of weakness. To prevent severe checking, fairly mild conditions must be used during the early stage of drying. This means keeping temperature low and humidity high. Eventually, the drying shell becomes `set' in its stretched state. Once this point is reached, drying conditions can be `turned up'. Temperature may be increased which causes the relative humidity to fall, and more rapid drying to begin. During the kiln-drying process, temperature is gradually increased, and humidity is continually lowered. Increasing the heat causes more rapid drying and in the late stages this overcomes the increasing difficulty of removing the moisture. What usually happens, referring back to Figure 31, is the moisture gradient remains. This may cause trouble later in furniture (for example) if the core area dries and shrinks. To overcome this, wood is usually over dried slightly, and then conditioned. Moisture is introduced and absorbed back in the shell and the cross-section reaches a constant moisture content. Drying stresses are relieved by this type of conditioning. This type of kiln is most common in the industry (although perhaps not in Nova Scotia). A boiler produces steam heat transferred through vaned-pipes to the kiln. Reversible fans move air through the lumber courses. Conditions within the kiln are governed by remote controller-recorders, which respond to a pre-set schedule. A wet bulb thermometer, covered by a cloth wick, measures humidity. The difference between the dry and wet bulb thermometer readings - the depression - is a measure of the ability of the air to evaporate moisture from the wood surface. The dehumidification kiln has gained favour in recent years, largely because of its efficiency and it can be tailored to almost any capacity. In this type of kiln, moisture is drawn from the air in the kiln and condensed on cold evaporator coils, where it `gives up its heat'. This heat, in turn, is transferred to the refrigerant fluid causing it to vaporize. Vapour is cycled through the compressor where additional heat (the friction generated by the compressor) is picked up. At this point, the hot vapour is passed through the condenser where it gives up its heat to the dry kiln air. The vapour (refrigerant) then reverts back to the liquid state. Heat is generated and recycled continuously. Today, most dehumidification kilns have auxiliary heat sources that can be used for short periods, to bring the charge up to temperature initially and for increasing temperature quickly at other times - particularly during winter conditions. Softwood and hardwood veneer may be produced by: (i) sawing (very thin-kerf saw); (ii) slicing flitches, and by (iii) peeling round logs and bolts. The last process, peeling, is the most common for Canadian species. For very specialized applications, where the decorative features are most important, sawing or slicing must be used. Veneer is peeled in long, more or less continuous, ribbons on a veneer lathe (see Figure 32). Logs that have been `conditioned' by soaking in hot water are charged into the lathe and chucked. The log turns, while the veneer knife engages the log. 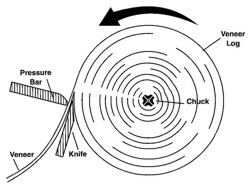 The knife is moved continuously and automatically inward as the log becomes ever smaller in diameter. The veneer `flows' on to conveyors where it is clipped into sheets, defects are removed, and it is finally dried in a veneer kiln or drier while still moving on line. In some cases veneer is the final product. However, many plants also operate a plywood manufacturing facility. Standard size plywood panels are 4 ft. x 8 ft. In making up the typical sandwich construction of plywood, plies are always `balanced'. This means that on each side of the central core of veneer, an equal number of plies are added, the last on one side being the finish or decorative face; while on the opposite a lower quality face. Total plies are always an odd number; eg. 3, 5, 7, 9 and so on. This is because of grain orientation. Beginning with the core (except for 3-ply panels) grain is oriented along the length of the panel (8'), the next two plies run at right-angles to the core (consequently these sheets are only 4' in length, but 8' in width). In all cases the two outside veneer plies are oriented along the length of the panel. During assembly of the panel, glue is applied to each sheet. The loose panel is then placed in a hotpress, where the adhesive is cured. There are many panel products on the market which utilize both residues from other operations; eg. sawmill, as well as under-used species. One of the more recent developments in this category is oriented strand board (OSB) which is made up of flakes or strands similar to the manufacture of waferboard (Aspenite). The main difference is that OSB aligns the component strands in such a way as to impart strength as desired - it is an engineered product. The strands may all be aligned in the same direction to provide strength along the board, similar to a laminated product. Or, as is usually the case, strands are aligned in layers in alternating 90 degree angles to each other providing strength along and across the board, similar to sheathing grade plywood, with which it competes. These include waferboard, particle board, conventional fibre board, medium density fibre board (mdf), and others. There are also a number of composite panel products using a decorative veneer over a particle board core. While similar in many respects, each of these products is manufactured differently using techniques that impart the special properties required. See Further Reading. Great strides have been made in pulp and paper manufacture, including the recycling of used paper products. The development of thermo-mechanical pulp (TMP) for newsprint is perhaps the most important advance in recent years. TMP uses large amounts of heat energy as opposed to mechanical energy required by stone groundwood, which it has all but replaced. The chipped wood, after being heated for a lengthy period, is fed to a disc refiner which separates the individual fibres, or cells. The resulting pulp is much stronger than groundwood. Therefore, it requires the addition of little chemical pulp to meet strength and other properties required for newsprint. In time, chemical pulps may be eliminated in the newsprint industry. Largely because of its size, this industry has had to adjust perhaps more than any other to environmental pressures, resulting in the development of less toxic refining and bleaching processes. Wood residues include those generated in the forest during harvesting, and those generated at primary and secondary manufacturing plants. Residues such as tops, roots and stumps, and defective stems represent huge volumes of bio-mass usually left in the woods. This material provides a source of soil nutrients for future growing stock. On average, this volume is estimated to be around 50 percent of the total stand. In some operations, where fulltree logging is carried out, almost all aboveground material is chipped and used. The average small circular or rotary sawmill recovers only about half (50 percent) of the wood volume of each log in the form of lumber. Up to 16 percent may be converted into sawdust, while 34% may be in the form of slabs, edgings, and trim-ends. Bark may represent up to about 14 per cent of total tree volume. The net lumber component for softwoods is further reduced when the lumber is dressed. As mentioned, hardwoods are usually sold rough. In softwoods, the planing mill will produce large volumes of shavings and further amounts of sawdust if resawing is practised. In hardwood plants, the residue will be in the form of dry sawdust, edgings, trim ends, and shavings. Most softwood sawmills convert about a third of solid residues into pulp chips. These are shipped to the nearest mill where they form an excellent pulp furnish. However, hardwood sawmills often cannot economically take advantage of this market. Only one pulp mill in the province accepts hardwood sawmill chips for pulp furnish. Fuel pellets, and the stoves that are designed to burn them, have become very popular lately. To be economically attractive the plant must gear up for a modest production - often beyond the capacity of a single sawmill or secondary plant's residue. Many sawmills, dry-kiln operators, and secondary plants use their residue to heat their plants and fire the boilers for dry kilns. However, most sawmills produce more fuel capacity than they can use. Co-generation power plants built in locations central to a source of wood fuel are another option for utilizing residue. The mill, or plant, receives all the heat it needs and disposes of the surplus to the power utility grid at a profit. A number of hardwood sawmills have installed relatively inexpensive slab saws which automatically cut up slabs and edgings into stove lengths. These, together with trim ends, are sold by the truck load around the countryside. This provides a ready cash product to such producers and they do not have to rely on the fluctuations of the pulp chip market. Sawdust, shavings, and bark have been used for many years as animal bedding, poultry litter, agricultural mulch, and other similar uses. Indeed, by using simple treating processes, wood can be transformed into a diet supplement for farm animals. We have already mentioned some panel and board products that can use a certain amount of sawdust as raw material. A product called wood flour was very popular and is still being shipped to producers of moulded plastics. Wood flour is used as a neutral extender or bulking agent. Anon. CSA Standard 086-1976, Code For The Engineering Design of Wood, Canadian Standards Association, Rexdale, Ont. Anon. 1991, Dry-Kiln Operators Manual, U.S. For. Prod. Lab., Madison, WS. Cech, M.Y. and F. Pfaff, 1980, Kiln Operator's Manual for Eastern Canada, Forintek Canada Corp., Ottawa. Culpepper, Larry, 1990, High Temperature Drying - Enhancing Kiln Operation, Miller-Freeman, San Francisco, CA. Folkema, Michael P., 1992, Handbook on Portable Bandsaw-Type Sawmills, For. Engineering Research Institute of Canada, Montreal. Maloney, T.M., 1977, Modern Particle Board and Dry Process Fibreboard Manufacturing, Miller-Freeman, San Francisco, CA. Wengert, E.M., 1990, Drying Oak Lumber, U. of Wisconsin, Madison, WI. Williston, Ed. M., 1988, Lumber Manufacturing: The Design and Operation of Sawmills and Planer Mills, Miller-Freeman, San Francisco, CA.